Salvation And Survival: Will We Be Judged As Bystanders? Will We Be Judged As Bystanders? Just a short 10 days ago, a coalition of speakers lobbied the United Nations to honor its Universal Declaration of Human Rights and the World Summit Outcome Document of September 2005, paragraph 139. In that document, the United Nations declared that the international community has the responsibility to protect populations from genocide, ethnic cleansing, and crimes against humanity. With that directive in mind, the group argued that the UN has largely ignored the plight of persecuted Christians and minorities in the Middle East and Africa. As Pastor Jonathan Cahn proposed, "So the question must be asked, 'Where are all the resolutions?' 'Where are all the troops?' 'Where are all the actions taken to protect the most persecuted people on earth?' 'And where's the universal outcry?' It's a strange and immoral silence." Indeed! 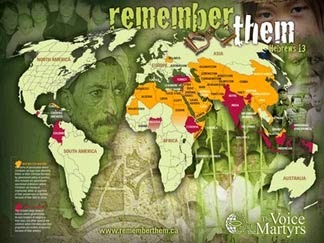 Where are the voices of all the Christian leaders throughout the world, and why have they not intervened? Are we all too comfortable and safe in our faith to think that this is just a blip on the radar screen? I assure you, it is not! While the rest of the world is eagerly anticipating the release of the Apple watch, Iraqi children are choosing between converting to Islam or giving up this life for Jesus. While Christians are slaughtered in African villages, millions of Americans are voting for their favorite dance team on Dancing With the Stars. ISIS is not the only enemy to Christianity throughout the world -- Apathy and Indifference are equally formidable. Sympathizing is not enough; it won't stop the genocide. For genocide is what is being perpetrated on Christians around the world. Every trace of their existence is being wiped clean whenever possible. Villages in the Middle East that still speak the Aramaic language spoken by Jesus, and which predate Islam by 700 years, are being decimated and erased from their existence. In India, 70,000 Christians have fled their homes; 80,000 Syrian Christians have been cleansed from their communities; and 10,000 Indonesian Christians have been killed in recent atrocities. As modern-day Christians we have all imagined what it must have been like to be seated in the Roman Coliseum and watch Christians being led into an arena full of lions. How did those bystanders in the arena justify their apathy? How did the German Christians who lived near the Nazi death camps rationalize the smoke from the crematoriums, or the cries for help from the boxcars that passed near their towns? How are we able to defend this generation's lack of action as we watch fellow Christians being devoured by this century's Satanic hatred and sadistic cruelty against the followers of Jesus? Are we even aware that more Christians have died [due to oppression and violence] in the modern era that in all of history combined? Do we care enough to do anything about it -- or are we somehow able to separate ourselves from our fellow Believers? We are all familiar with the verses in Matthew, Chapter 25, in which Jesus advises us that He will gather us before Him one day, and separate us into sheep and goats. Keep in mind, these are all Christians gathered before Him! To the sheep on His right hand, He will pronounce their inheritance of His Father's Kingdom because they fed Him, gave Him water to drink, a place to sleep, and clothes. To the goats at His left hand, He will refuse to recognize them, will curse them, and send them into the eternal fire prepared for the Devil and his angels. When asked by each group why they received their lot, it was based on how they treated the "least of His Brethren". Whatever they did for them, they were doing to Jesus. Did you get that? 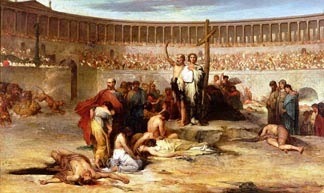 However they responded to a need of one of Jesus's brothers or sisters, would determine their sentence. So how does that translate for us modern Christians? When we see a fellow Christian in Iraq being beheaded, and stand by and do nothing, we are beheading Jesus. When we see a Christian brother being crucified in Syria, and stand by and do nothing, we are crucifying Jesus. When we see Christian families being tortured, burned alive, and forced from their homes -- and stand by and do nothing, we are committing these horrendous acts against Jesus. As Pastor Cahn so eloquently stated, "We are no longer a good or Christian nation, if we sit idly by. We will be judged guilty." Are we comfortable in our silent complicity? Do we only take our own self-interest to heart? Where is the outrage from Christ's Church, and what is each one of us willing to risk our lives for, and fight for -- yes, even die for --- if not for fellow Christians? Whether the Western Church as a whole, or each of us individually, is willing to admit it or not, we will either be upheld or condemned, based on how we respond to today's persecution of Christians around the world. It is not enough to pray ... I didn't see Jesus mentioning "whenever you prayed for one of the least of my brethren". Everything involved some form of action. We must demand that the leaders of our nation and the world, take action to stop the genocide and persecution of our fellow Christians. It is time to recognize that the number of those crying out underneath God's altar is increasing at a rapid rate, and may be near the final number. They are the souls of those who have been slain because of the word of God, and because of their unwavering testimony of faith in Jesus. God will soon answer them as they continue to call in loud voices, "How long, Sovereign Lord, holy and true, until you judge the inhabitants of the earth and avenge our blood?" We must not be silent any longer! Psalm 94:16 "Who will rise up for me against the evildoers? Who will stand up for me against the workers of iniquity?" I have been reading your post for a few months now, and I agree with much that you say. Today's post took me aback. You speak about the sheep and goat judgment referring to the way Christians treat or support others. The sheep and goat judgment refers to the Christians who maintained, or not, their salvation during Daniel's final week. This is the issue because the Holy Spirit will no longer be sealed within the believer after the rapture of His church. You are proposing an unscriptural yoke be put upon believers in His church. Please reevaluate your position, for many read your blog. Thank you, John, for offering your questions on my viewpoint. As fellow Christians, I love the opportunity to debate, for iron sharpens iron, right? I fully understand your interpretation of this Scripture, and recognize that many agree with it. I will admit that I should have backed up my supposition with more explanation, so I will now tell try to do a better job .... The reason that I entertain the proposition that the goats could be other Christians, is that in Matthew 25:44, Scripture says, "Then they also [in their turn] will answer, Lord, when did we see You hungry or thirsty or a stranger or naked or sick or in prison, and did not minister to You?" The fact that they called Jesus "Lord" catches my attention! In 1 Corinthians 12:3, Scripture tells us, "Therefore I want you to know that no one who is speaking by the Spirit of God says, "Jesus be cursed," and no one can say, "Jesus is Lord," except by the Holy Spirit." To me, this implies that anyone who calls Jesus "Lord" is indwell by the Holy Spirit. Now, I must also tell you that I do not subscribe to man's doctrine of "Once Saved Always Saved", so I do think that there is a possibility that there will be some who call themselves Christians who will be blotted out of the Book of Life. But that's another debate! We are to follow in Jesus's footsteps ... PEACEABLY call the world's attention to the persecutions, through contacting local, state, national and world leaders. Give what you can to charitable and humanitarian efforts to provide comfort to the victims. Organizations like Open Doors USA are nonprofit and assist persecuted Christians. Above all else, do not cower in your faith. Be bold and stand for Christ in this world, so that you might stand before Him in the next without shame or guilt. Above all else, know that we are called to suffer in His name. I just want to remain faithful to Him til the end. Thank you for writing on this subject of the cruelty and inhumanity of what is going on around the world, especially towards brothers and sisters of our faith in our Lord Jesus. The atrocities are increasing daily and I also believe that our time is close to having the wrath of God come upon all nations that do nothing or commit these crimes of life towards other human beings. God will NOT be mocked and it will be made known. I wish that more people would realize that our own country is under serious attack against Christians and if they think this only happens to others outside of our bounds, they are in for a big surprise. People need to GET SERIOUS NOW and deal with this. Pastors and others who claim to be Christians need to make a stand. Those who say nothing, do nothing and skate around are sinning and will be held accountable. What will it take for us in the U.S to do something about this? Everything that you've said is so true and again, thank you for bringing up this subject that many seem to be avoiding these days. One voice that can lead to others, can start something that can help turn things around. God's blessings to you. May God give us direction to make a difference.